KM, the Remix: shouldn’t it be “Collaborative Services”? KM IS EVOLVING, most everyone seems to agree on that. But the burning question remains: in what direction? I believe “Collaborative Solutions” provides a better umbrella for the practice of Knowledge Management (“KM”), simply because it makes more sense. And if it makes more sense, it should resonate better with C-level executives who need fund it and personally endorse it. KM emerged in the 1990’s as an amalgam of vendor marketing and good intentions, where work group tools and new collaboration processes seemed to create a synergistic blend of capabilities. Unfortunately, KM often struggled to get buy-in, and semantics was a factor: you really can’t “manage knowledge”. You encourage people to develop it, share it, enhance it, and reuse it. That’s both a leadership challenge and a culture challenge, since corporate culture tends to dramatically deemphasize sharing in favor of producing results. Make no mistake, results are critical. But in a knowledge-driven economy, collaboration is increasingly the driver of how those results are achieved, especially where there is an imperative for innovation. 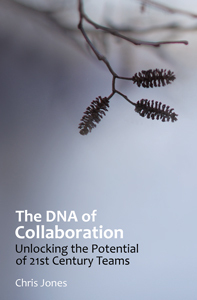 Collaboration demands more mind share. So think about “Collaborative Solutions” as a better delivery vehicle, and “Collaborative Services” to describe the activities of practioners who are driving it. What’s in a name? For KM, way too much. What has failed and fallen by the wayside? Primarily software applications that promised to improve knowledge utilization and management within organizations have failed to live up to expectations. There are still number of issues that dog these applications. In my view the first constraint is the database orientation that is still the order of data collection frameworks within organizations. What we need are knowledge base architecture. In essence knowledge is multi-dimensional and existing database architectures are incapable of coping up with multidimensionality and networked relationships. The second constraint is our pre-occupation with documents. Al though documents are created using data, it becomes more difficult to extract data from out of documents. Documents are formatted in so many ways and styles and are hardly amenable for standardized data management. At best they can be digested using string queries. But we all know the limitations of string queries. KM would flourish only when we move away from documents and create documentless knowledge.